Thanks to the handy Live View feature, CSS changes can be previewed while editing, before they appear to site visitors. Previews display in real time and open in a second browser tab for extra convenience. Changes to the code are documented through a history feature. Here, timestamped revisions are stored automatically when the code is saved, and can be reverted to if need be. Adding to the already enjoyable user experience, the code editor offers syntax highlighting, including easy to use line numbering, automatic indentation and color coding, to make the code writing process even easier. The plugin also saves changes via AJAX without reloading the editor to ensure that users will not lose their place while writing lines and lines of code. Use the CSS Live View functionality in the Custom CSS editor to preview CSS changes in near real time in a second browser tab/window (on supported web browsers). CSS Live Preview works on any page in your site, not just the homepage. 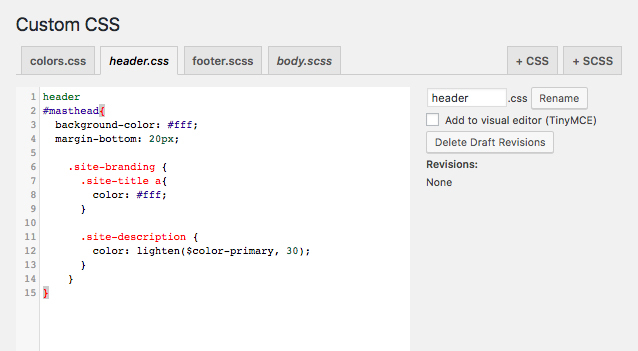 Use features of the SASS CSS extension language, such as variables, nesting, and more. A SASS compiler is included with the plugin. Multi-file interface splits code across multiple virtual files, accessed via tabs above the editor, allowing the developer to work systematically and organize code files. The multi-file interface works using a single file compile process, helping to preserve frontend performance. Compatible with any standards-compliant WordPress theme. 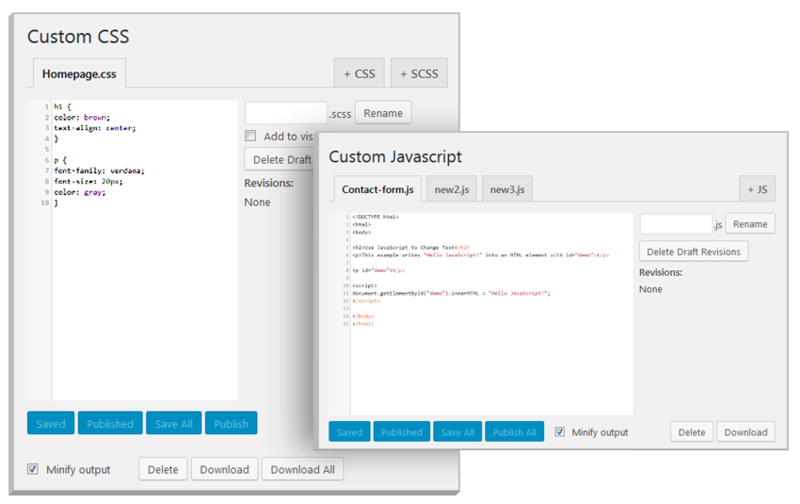 In the Custom CSS editor, the user is able to view all of the virtual .css and .scss files saved in the plugin. With the tabbed display, which separates virtual CSS files, the user can work efficiently and effectively without losing track of snippets or searching through lines and lines of code. 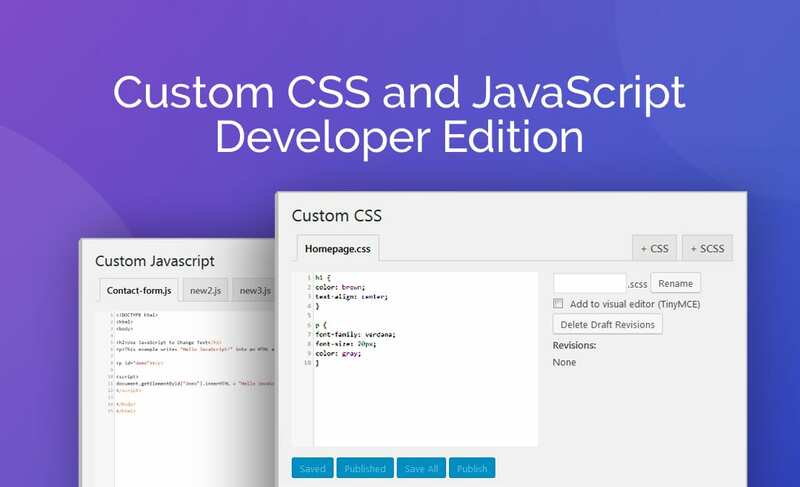 The Custom CSS editor comes complete with support for the SASS CSS extension language, allowing developers to make use of variables, nesting, and so on, with built-in automatic compilation to regular CSS. 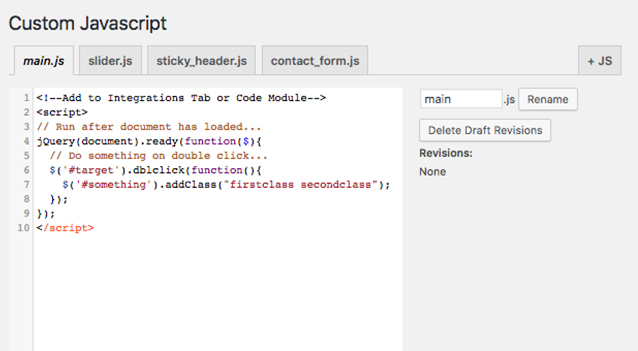 Also included within the Custom CSS feature is the ability to preview work in real time. This feature is only available for use with compatible browsers.